Hobie Forums • View topic - Are you waiting for the RACK-AND-ROLL trailer to go on sale? Are you waiting for the RACK-AND-ROLL trailer to go on sale? Post subject: Are you waiting for the RACK-AND-ROLL trailer to go on sale? $2,387.00 ...add tax or shipping, and it nearly costs as much as my slightly used AI. Used Rack-and-Roll trailers are like used Adventure Islands: Hard to find! (...although I spied a R+R on the Raleigh, NC CraigsList for $1,500). So I figured this was my best chance for a deal on a new one. When I called, the shipping was free for my order over $99 (4 boxes, I think they said) - and there's still no sales tax (unless you're in VT). The site says this sale is through June 22nd (today) - but their rep told me on the phone they decided to extend the sale through the 28th. So if you've been thinking about a Rack-and-Roll trailer, you might want to call them to confirm the extended date (or order one yet tonight). I have no affiliation with Yakima, Rack-and-Roll, or ORS RACKS DIRECT. This is more or less a courtesy announcement. And yes, I know, the money I saved will go toward tag fees and taxes - but it's still better that regular price. joanie / Hobie enthusiast: 4 H-14Ts, 2 Waves, FloatCat 75, 4 Adventure Islands, and my DUNE Tandem Island! . . . . . . . . . . . . . . . . . . What can I say? I never met a Hobie I didn't like . . .
Last edited by toomanyboats on Tue Jun 23, 2009 8:17 am, edited 1 time in total. Post subject: Re: Are you waiting for the RACK-AND-ROLL trailer to go on sale? I know the Rack and Roll trailer is pricey but I have never regretted purchasing one two years ago. Just using a trailer rather that car topping them is a lot easier & safer loading & unloading. But being able to move the trailer by hand loaded with boats is awesome. Sometimes there is quite a distance between the parking area and the put in. I have made several trips taking other people kayaks & canoes. And of course it breaks down for storage. I mention this for anyone that is having trouble topping boats. It doesn't have to be a Rack and Roll but using a trailer has advantages with few dis-advantages. Post subject: Re: RACK-AND-ROLL on sale? I just checked the ORS website for a friend, and it's now too late for the Rack-and-Roll trailer deal. The ORS rep was half right: They've extended the Yakima 20% sale, but only until the 26th (not 28th) - - and trailers are no longer included. (Neither are Yakima roof boxes and spare parts.) Sorry for the short window of opportunity. Our AI single trailer is aluminum, lighteight and less than half the price of the rack&roll. Have a look at our catalog and call a dealer toll free 1800hobie49 for help. I think another significant advantage to the trailer we have, over the Rack-n-roll, is the height of the load. The rack-n-roll is like a rickshaw, large wheels, but the load is not at the axel height... it is higher, less stable and harder to load / unload. Especially for the Adventure Island. Here in the UK, I have never come across a simple trailer for a single kayak. The problem with trailers is that they are very 'nickable' (easy pickings for thieves), and sometimes tricky and/or expensive to park. For a single kayak, it ought to be possible to devise a trailer which would collapse and stow in the car, out of sight. How about a road-going version of the kayak beach trolley strapped to one end of the kayak, and a separate towball hitch which would attach directly to the other end? I have been in a place where wasn't a place to park a car & a Rack and Roll trailer. So I removed the tongue, placed it inside the car, tipped the trailer on end with the tires touching the bumper, ran a cable around the trailer & then through the hitch where you hook the safety chains & put a lock on it. Only used one parking space. I do carry the cable & lock with me for this purpose or to secure the boats to a tree if I have to do a car shift on the river. Its "not out of sight" but it is somewhat secure. I've owned a Rack & Roll for 2 years now. I really like this trailer. Yes, the Hobie trailer is cheaper but, as pictured, it looks as if it only holds one yak. That just might "fill the bill" for many. The Rack & Roll, on the other hand, comes complete with a long set of Thule bars. With such long bars I regularly place 2 Hobie yaks (in this case an Outback and a Sport) on "L" racks mounted near the center ...and I still have room for 2 upright bike racks in the outside reaches of the bars. That's a great combination for long driving vacations. I also like the larger tires. Been on rough roads and also 80 mph on freeways without a problem. The wide stance between the wheels keeps this trailer very stable, as does the heaviness of the "designer" wheels, which "secretly" lowers the center of gravity. The larger tires also keep the yaks up higher, and farther away, from any road debris that might get kicked up. And the only "bounce" I ever get is taking a speed-bump too fast. There is another trailer out there called the Sports Rig. Very similar but made of steel instead of aluminum. But it is just slightly cheaper once you find you have to purchase a longer tongue to accommodate even short kayaks. Both were designed by the same guy. The R&R is the newer design. I've found that trailering my yak was superior to trying to get them up on the roof of my minivan (almost impossible for an old guy like me to do single-handedly). And gas mileage is way-improved over roof mounted. The down side is that you need to be careful not to enter into, say, a fast food parking lot without casing the joint beforehand for a decent trailer friendly parking space. Storage can also be a problem in some situations (yes, you can take the wheels and tongue off the R&R in minutes and store the whole thing flat against a wall, but who wants to do that routine every time they sail?). In my case I just leave the yaks on the trailer in the garage and store my "yak things" (such as seats, PFD's, etc.) in large plastic tubs on the floor under the trailer. As for security, I have a trailer tongue lock, trailer hitch lock, and 4 coil cord security cables weaving through the "J" racks, bile racks, bikes and kayaks. Yes, if somebody really wanted to steal the load, they could. But at least it's safe from most low-lifes. If you can put your yak in or on top of a car easy enough, stay away from the complications of a trailer. But if you find you can't get your yak on your car by yourself, a trailer is the answer! Like most things Hobie, they are proud of their product. The single kayak trailer by hobie is so over priced. A Continental 2 kayak trailer with 78 inch crossbars can be purchased for $ 650.00 and is very functional. I understand this is an old post but feel obligated to praise the Rack and Roll (RR). I purchased mine in 2009 (78 inch bars). I live in Delaware but routinely travel to the Boundary Waters in MN, the Upper Peninsula of MI, the Adirondacks, Southwest Florida, and a few trips to Santee, SC. No issues at 75 mph and only slightly less mpg while tolling. Usually, my Outback goes but sometimes two Hobies or a couple of canoes. One time I took my PA14 to the Adirondacks (sold the PA as it was too heavy and time consuming to load and unload then stow the PA in the shed). I like that RR folds quickly and easily and sits out of the way in my garage. The only issue I have with the RR is that in a long day of rain, the permanently sealed wheel bearings can get wet and seize after setting a few days. A set of bearings are $80 plus the cost of a shop pressing in the new bearings. This has happened a few times. To me, the bearings are a minor inconvenience. I’m sure there are many fine kayak trailers available; however, I have not one time regretted my decision to get a RR. Last time I used one, the Rack-N-Roll did not have sealed bearings. You shouldn't submerge the rear hubs when launching your boat. A friend that had the R&R submerged his twice in a week. A month later the bearings were shot. 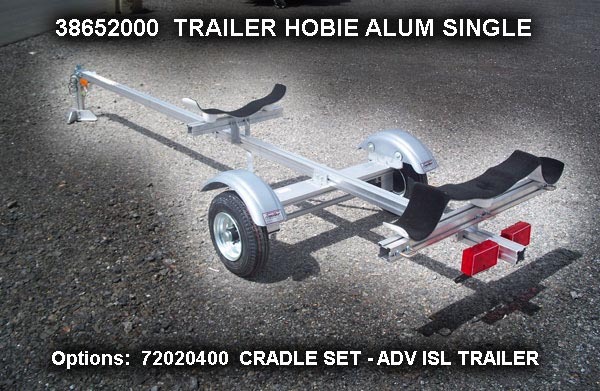 Conversely, the Hobie Trailex trailer has standard submersible trailer hubs. I have two of these trailers and in a half dozen years and plenty of boat launches they're both still doing fine. They should get the standard maintenance, of course, but they are made to be submerged. I do like the design of these trailers, curious if the wheel tread holds up okay? The downside here would be I'm not sure the length of a kayak you could haul plus you need a parking space that could accommodate a trailer.